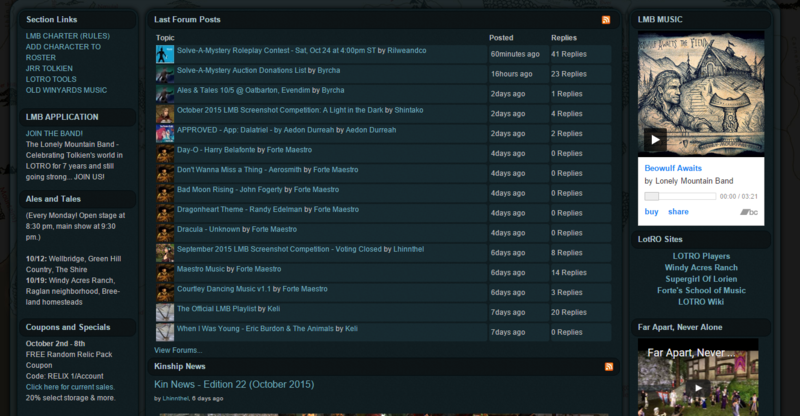 The Dark Wolves homepage probably has more going on than any other entry on this list. Even at first glance, you can tell that this guild is very active. They’ve got up-to-date guild news and the latest forum posts right on the front page, and there’s a Twitter feed widget on the side so members and prospective members alike can keep up with their social media activity. Consistent updates like this really help members stay involved. Look at all that stuff. There’s so much to click on. So much to do. On the right, you can see who’s currently online, how the guild is progressing in raids, and any upcoming raids that members can participate in. Many of the guild announcements and social media posts are about new achievements and raid results, which helps prospective members gauge how successful the Dark Wolves guild is and what sort of events they’re participating in right now. This is vital if you want to attract new people to your guild. There are so many other things that we could list here, but we’ve got to save a few things for the other entries in this list. So we’ll hang on to that thought for now. Ethereal Army didn’t pack quite as much into their homepage as Dark Wolves did, but there is a lot of vital information that they put front and center. Rather than focusing on current activity and celebrating achievements, the Ethereal Army site draws attention to the purpose and mission of the guild. 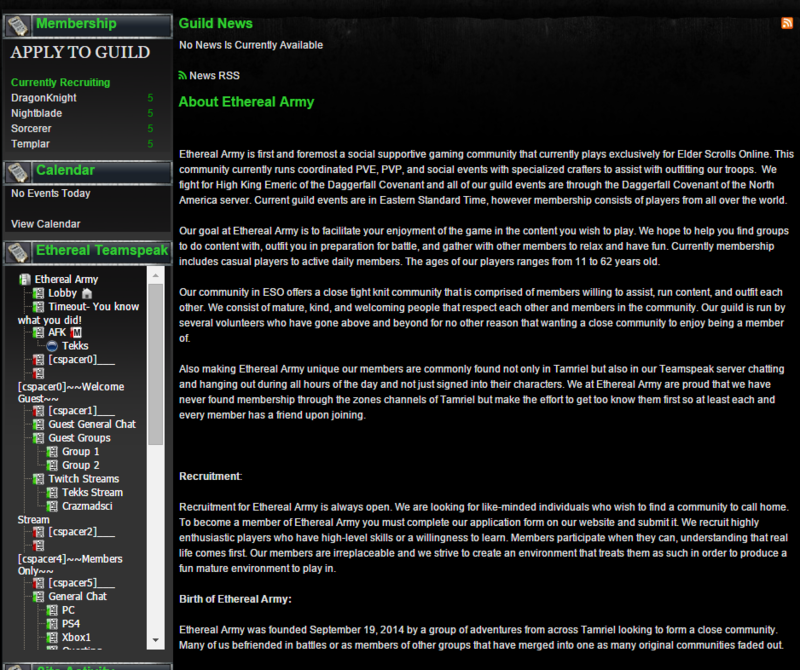 The “About Us” section that takes up most of the home page gives prospective members and idea of what kind of guild the Ethereal Army is, which game they play, and what they’re looking for in new recruits. They’re currently recruiting all the things. Daggerfall Covenant unite! On a similar note, there’s a helpful little widget on the left side that gives the current recruitment stats for the guild. You can see which classes the guild is looking to recruit, and how many openings there are for each one. While something like this could potentially prevent people from applying to your guild because they don’t see openings for their class, it could also encourage others to apply when they see that you’re in desperate need of a few Nightblades. Events are the name of the game here. 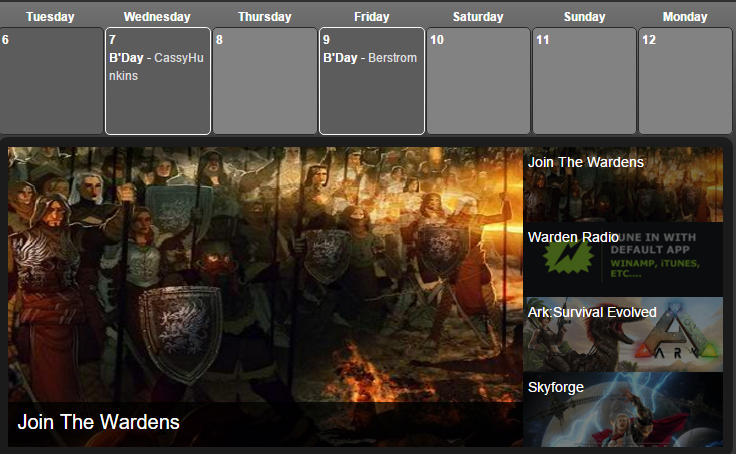 The first thing you see when you click on the Grey Wardens’ site is their calendar for the week. For guilds that do a lot of events, using the calendar to its fullest extent is key. Prospective members can use this widget to get a quick idea of what events your guild is participating in. But the Grey Wardens didn’t stop there, they also included member birthdays on their calendar, so their guildmates can remember to wish them a happy one. Some people have birthdays coming up. Wonder how their characters will celebrate. 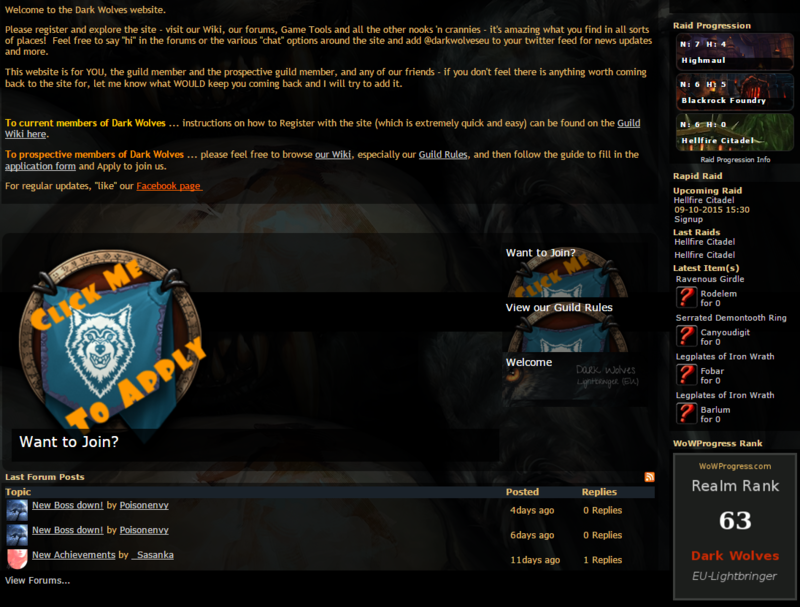 The Grey Wardens also added some extra visual interest to their homepage with a nifty little slideshow that provides links to their membership application, the guild’s radio stream, and the official sites for the two most recent MMOs they’ve expanded into. Not only do these little touches attract a visitor’s eye, they’re also an effective way to fit more information or resources onto your homepage without taking up extra space. This guild opted for a more streamlined homepage. While at first this may seem like it might limit engagement, take another look at the site. It’s polished and professional-looking, and there isn’t so much content that you feel overwhelmed. Without even having to scroll down, you can see upcoming events, latest forum posts, membership openings, info about the guild, and even a donation button. Sorry, WoW players, there aren’t a lot of spots left. But everyone else is in luck. Phoenix Battalion is a multi-game community, so it’s easy to see why they would opt not to include game-specific content on their main page. Giving bits of information about every single game they play would not only clutter the page, but it could also cause potential recruits to click away. If someone wants to be part of a Guild Wars 2 group, but you have a raid progression tracker for World of Warcraft on your front page, that player might simply assume that GW2 isn’t your thing – even if it is your thing. Even if it’s your favorite thing. Phoenix Battalion simplified all this by simply noting in their description what games the members play, then listing whether or not there were openings those games in their recruitment widget. This is very similar to what Ethereal Army did with their class recruitment. Within a few seconds of seeing that widget, a prospective member is not only able to determine whether or not the Battalion is active in their game of choice, but also whether or not they need more players for that game. When applicants know what you’re looking for, you get a lot more applications for positions that you do need than positions that you don’t. Everybody wins. Unlike Phoenix Battalion, The Lonely Mountain Band packed as much information as possible into their home page. The latest forum posts and guild news announcements are in the spotlight, highlighting both the guild’s active community and a few upcoming events that might be of interest. If you scroll down a little, you’ll find all you need to know about the guild and its rules. Work on the left, play on the right. Life is all about balance. The left sidebar has most of the key information that doesn’t fit into the news section. There are links to the guild rules, resources for Lord of the Rings Online, quick summaries of ongoing and repeating events, and even a list of coupons and specials for the LOTRO Store. To balance all that out, the sidebar to the right is populated with fun stuff like videos, an official Lonely Mountain Band playlist, and a slideshow of the most recent images from their gallery. All these bells and whistles may seem like a distraction, but they give current and prospective members a lot of opportunities to engage with the site and encourages them to explore more. Whether you prefer this approach or the more minimalist approach of Phoenix Battalion is entirely a matter of personal preference – both have their pros and cons. This is easily the most visually striking site on our list. This is the kind of homepage where you come for the gorgeous design, and you stay for the interesting information. As a guild that’s been around since 1997, Sanctus Covenir has an image to uphold – and they do so with official colors, a guild crest, and more scrolls than any scribe would ever need. Such official. Much theme. Wow. 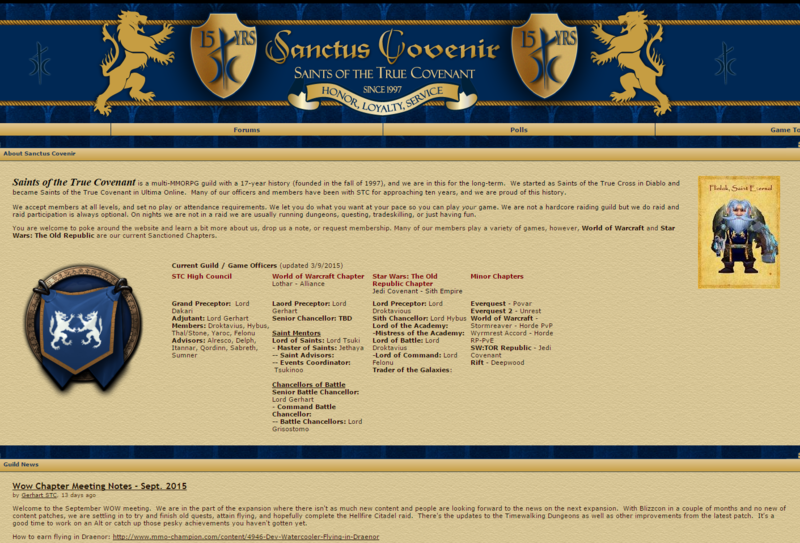 Once you’re done being dazzled by their theme, you’ll notice that Sanctus Covenir’s site makes it appear to be more of an organization rather than “just a guild”. They’ve got a mission statement and basic recruiting information – like any other site worth its salt – but right beneath that, there’s a list of guild officers and their roles, similar to the staff page that you’d see on a company website. Below that, you’ll find the notes from the most recent chapter meeting. These elements not only lend an immediate air of professionalism to the guild, but it adds a degree of transparency that makes it feel more trustworthy and accessible. Current and prospective members alike can see what’s going on in the guild at any given time, which is key to making them feel like part of the group. In addition to all of that information, this site also focuses heavily on the guild’s prestige and current in-game activity. In both sidebars, you’ll find raid progression trackers for both of Sanctus Covenir’s main games, their Warcraft logs, Mumble server status and availability, WoW and SWTOR server status, and even recent awards that they’ve won. This lets current members celebrate their achievements and see what their guildmates are up to, and prospective members can get an idea of when the guild is most active and how they’re spending their in-game time. You’ve probably noticed that most of these sites have at least a few things in common: guild news and forum posts are usually somewhere on the homepage, and every single site has an application link somewhere on there as well. Ultimately, which features you focus on will depend on what your guild values most at any given time. 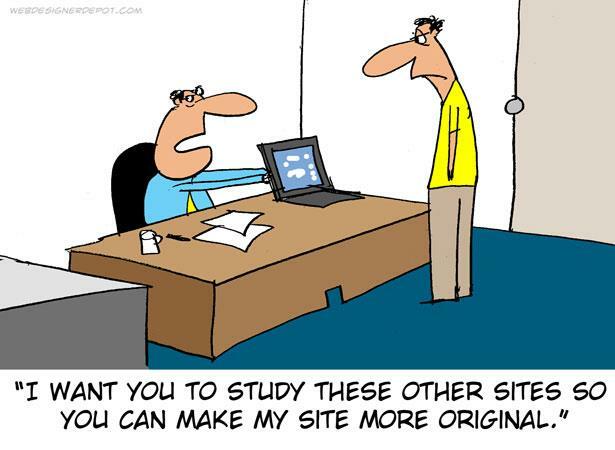 If you need more recruits, then you’ll probably want to have a lot of recruitment-related content on your home page. But if your guild has loads of events coming up, calendars and sign-ups are going to be your key features. Of course, you can always change it up whenever the circumstances call for that. More than anything else, remember that your guild site should be a place that fosters a real sense of community among your members. The features that you prioritize should encourage your current guild members to converse and participate, but they should also appeal to potential recruits (if new members are something you want). As you’ve seen demonstrated above, sometimes you can do both those things at once. Whatever elements keep your guild informed and active as a community should be at the forefront of your site. If you have a guild website already, take a look at what is and isn’t working for you, then try reworking your homepage (or even your whole site, if you’re feeling ambitious) to bring more attention to those key features. If you don’t have a guild site yet, head on over to Gamer Launch and get started on making one. Draw as much inspiration from our favorites as you like, but don’t be afraid to explore other options and features to see what really works for you. It’s all about your guild’s personality and unique needs. When you’re finished, leave a link to your new (or revamped) community site in the comments below. Who knows – maybe your guild will make our next list.